Wow, it sure has been a while. It’s not that I haven’t had anything to say, quite far from it. It’s just that I haven’t had near the time to write it all down. Be excited for a whirlwind of activity pasted into a succinct blog, of sorts. Back on September 6th, 2012, four Rotaractors from the district (PE Mia Petrichenko, PD Manvir Chutai, President Desmond Devnich and DRR Jennifer Petrichenko) were honoured to attend the “Remember 9/11” musical in Mount Vernon, WA. It was a gala event filled with good food, great wine, awesome music and lots of fellowship. All four of us really enjoyed ourselves and would like to thank the many District 5050 members who donated their tickets so that we could attend. Both the Rotaract Club of Chilliwack Fraser and the Rotaract Club of Cloverdale celebrated their club birthdays this fall. Chilliwack, who celebrated their first decade back on October 24th, collected canned food items for the local food bank during the day then celebrated their big day at a local pub. Cloverdale, who celebrated on November 19th, had a low-key night of *too much* pot luck food, fellowship, trivia and Christmas Candy Wreath making at a member’s house. I would like to take a moment to really congratulate both clubs on their achievements over their chartered lives and wish them all the best in their future endeavours. October 13th was the district Membership Seminar in Mount Vernon, WA. Members from both the Cloverdale and Chilliwack Rotaract clubs were in attendance learning best practices in Rotary Membership. I took a number of ideas away from the day and hope to implement them in the coming future. October 19th and 20th will stand out as special days in my Rotaract life, I’d like to take a minute to share them with you. October 19th, Polio Walk. Rotaract members from the district were invited by DG Sean Hogan to take part in a Polio Walk along the sea wall in Vancouver as a public awareness/publicity campaign to “End Polio Now”. After a solid week of dark skies, cold winds and giant raindrops the clouds parted just enough to save the 100+ walkers from wearing their red “End Polio Now” ponchos for anything more than fashion. The walk started at the Westin Bayshore and ended up at the Olympic Torch beside the Vancouver Convention Centre. There are pictures posted on the @RotaractClover Twitter account or on the Rotaract Club of Cloverdale Facebook page. The walk was short but awesome. 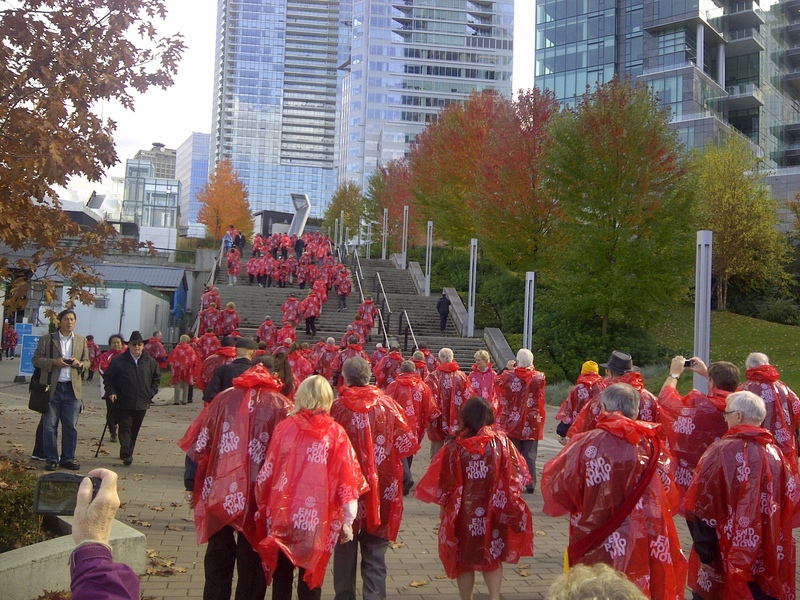 It was really cool to see so many red ponchos bouncing across the waterfront. Once we hit the finish point there was a large group picture then President Janice Khunkhun and I stole away a moment to take a most excellent picture of just the two of us with RI President Tanaka. A picture that has served us quite well as a PR item. Thanks President Tanaka!!! October 20th, Zone Institute and Gala Dinner. Day two brought another invitation to attend the Zone 24/32 Institute for the day and the International Gala Dinner at night. The Institute was fairly interesting. It is an event that I haven’t had a chance to attend to date. They rotate through different locations in the zones and include Canada, part of the USA, part of France, Bermuda, and part of Russia. For the dinner we were notified well in advance that it was International Night therefore we should come dressed in the traditional costume of our people/ancestors. So me, with heritage that traces back to Europe (mainly the UK, Poland, the Ukraine, and Iceland) I chose Iceland as my representation. The costume is unique, I knew almost for certain that no one else would have the same costume, and quite frankly it was the easiest to get together considering we had to change in the parking lot. So proud of how we dressed, Manvir, Manprit (although she came in a pant suit), and Janice walked into the event centre to see that in fact we were the ONLY people dressed in traditional costume. With the exception of two other people, that was it. Holy Hannah was that awkward. But you know what?! We wore our garb with pride, kept our heads held high. I think President Tanaka appreciated it, he wanted to get lots of pictures with us at any rate. The second part of Rotary Leadership Institute for Chilliwack President Desmond and myself was held earlier this month is Surrey, BC. I am proud to report that we had an additional three Rotaractors from the Rotaract Club of Cloverdale join in as well. Part II, much like Part I, didn’t really offer up anything that we didn’t already know or know how to get a hold of, it did give different insights on how and why certain things happen though. What I found to be interesting was the new grants process and the journey that districts have taken over the past couple of years through pilot programs to get everyone up to speed for the 2013-2014 year. Grants do not really come into play for us as Rotaractors but it is good to know how they work and why certain steps have to happen. Again, if you are interested in RLI or want more information on it, just let me know and I can answer what I can or point you in the right direction. Well, that’s all for now. I will be updating soon with a rather awesome announcement, so stay tuned! Reblogged this on Chilliwack Fraser Rotaract Club.